Trinidad and Tobago’s 4-4 tie with Mexico in the 2015 Gold Cup group stage last night was the talk of CONCACAF. 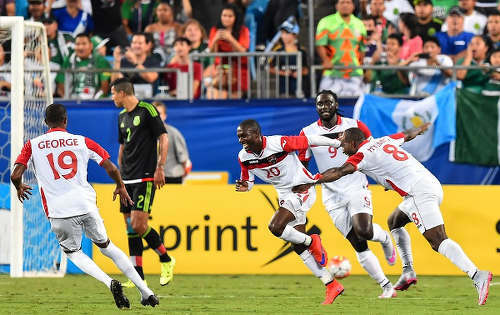 Photo: Trinidad and Tobago midfielder Keron Cummings (third from right) celebrates his second strike against Mexico with teammates (from right) Khaleem Hyland, Kenwyne Jones and Kevan George at the CONCACAF Gold Cup. The match featured seven second half goals with one item from either team in stoppage time, including a last gasp equaliser from “Soca Warriors” defender Yohance Marshall off the final set piece of the match. “At first I tweeted out it was the best group stage match I had ever seen in the Gold Cup,” said veteran Fox Sports correspondent Michael Lewis. “I would like to think I have a right to say that. I have been covering the competition since 1998. Marshall, who plays professionally in El Salvador with Juventud Independiente, said the remarkable outing still had not fully sunk in. “It’s a big statement for us,” Marshall told the TTFA Media. “No one other than ourselves expected we could put up such a performance against them (Mexico) and we proved out there that we can match up. 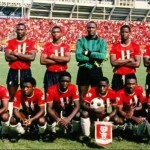 But where does the eight-goal thriller rank with other exciting Trinidad and Tobago results over the years? 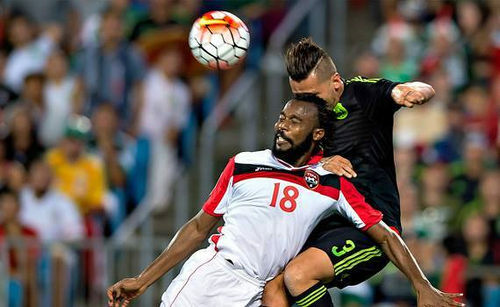 Photo Trinidad and Tobago defender Yohance Marshall (left) wins a header from Mexico defender Yasser Corona in CONCACAF Gold Cup action. There is contrasting information as to who got Trinidad and Tobago’s winner. But goalkeeper Lincoln “Tiger” Phillips kept an historic clean in Winnipeg as the tiny Caribbean nation took its first major scalp, just two years after earning FIFA status. The Argentina team, which had three gold medals and one silver from its last four Pan Am campaigns, left the ground in tears. With Everald “Gally” Cummings pulling the strings and attackers Steve David and Warren Archibald in flying form, Trinidad and Tobago tore Mexico apart with a ruthless display of counter-attacking football in Haiti. It took a dodgy referee to deny this team a place at the West Germany 1974 World Cup as they finished second to the host nation. 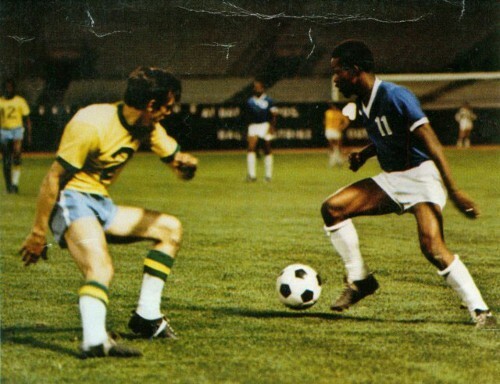 Photo: Trinidad and Tobago icon Warren Archibald (right) wrongfoots NY Cosmos defender Barry Mahy while representing the Washington Darts in the NASL during the 1970s. With two minutes to go, 21-year-old midfield wizard Russell Latapy drew a few opponents towards him, turned and laid the ball into the path of soldier Kerry Jamerson whose cracking long distance shot sparked an outpouring of calypso, soca and dub tunes as Trinidad and Tobago football fans partied for three months until that fateful day on November 19. After booking their place into the Gold Cup quarterfinals for the first time, Trinidad and Tobago promptly lost star Dwight Yorke who was returned to Manchester United against coach Bertille St Clair’s wishes, while Russell Latapy was substituted with a groin strain. Still, in extra time, substitute Mickey Trotman became the hero with a crisp finish that took T&T to the semifinals for the first time. Photo: Trinidad and Tobago attacker Arnold Dwarika (top) drives home his country’s opening goal in the 2000 CONCACAF Gold Cup quarter-final against Costa Rica. Trinidad and Tobago was already eliminated when the squad travelled to face a Honduran team that was on the cusp of its first World Cup campaign. The “Soca Warriors” had just lost Mickey Trotman to a fatal car accident and decided to dedicate the game to him. T&T had Aurtis Whitley sent off in the first half hour but Trotman’s best friend, Stern John, scored and the Warriors held off wave after wave of Honduran attacks to clinch an emotional win. Only a win could save Trinidad and Tobago’s faltering 2006 World Cup qualifying campaign and, desperate for inspiration, TTFF special advisor Jack Warner negotiated the return of the 37-year-old Russell Latapy. Coach Leo Beenhakker was initially sceptical but Latapy scored a clever goal and helped inspire Stern John who broke a personal drought with two strikes in the 85th and 86th minutes to settle a thrilling affair. 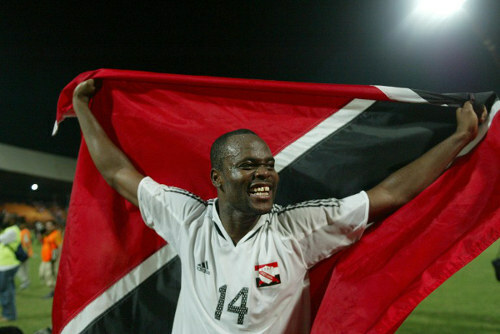 Photo: Trinidad and Tobago’s all-time record scorer Stern John. Bahrain only needed a draw to get to the 2006 World Cup and the tiny Arab nation predicted an easy win. Instead, Dennis Lawrence soared to crash home a header from a Dwight Yorke corner kick. And a stunning extra time save from Kelvin Jack meant Trinidad and Tobago had become the smallest nation to qualifying for a senior FIFA World Cup. The Warriors received some sobering drubbings in their pre-World Cup friendlies while defender Marvin Andrews failed to recover in time from a knee injury, goalkeeper Kelvin Jack pulled up lame during the pre-game warm-up and left back Avery John was sent off early in the second half. But veteran goalkeeper Shaka Hislop in goal, defender Brent Sancho, converted right back Carlos Edwards and, of course, captain Dwight Yorke were exceptional as the Warriors defied a Sweden team with two of Europe’s most devastating attackers, Zlatan Ibrahimovic and Henrik Larsson. It could have been even better too as substitute Cornell Glen struck the post! Photo: Trinidad and Tobago World Cup players Dwight Yorke (top), Dennis Lawrence (right) and Shaka Hislop celebrate after an opening goalless draw against Sweden in Dortmund, Germany. Both teams were already through to the quarterfinal round but Mexico needed a statement to appease their demanding fans. It looked like they would get it too after taking a two goal lead in the opening 50 minutes. But the “Soca Warriors” came to life spectacularly as captain Kenwyne Jones, aided by a supporting cast of Keron Cummings, Cordell Cato, Joevin Jones and Yohance Marshall went toe to toe with the 2014 World Cup team. By the final whistle, there were seven second half goals—with one from each team in stoppage time—as the Warriors grabbed an exhilarating 4-4 draw to top the group. 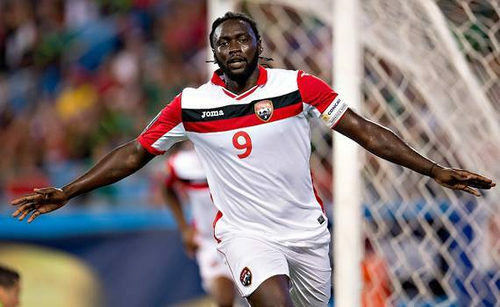 Photo: Trinidad and Tobago captain Kenwyne Jones celebrates his goal against Mexico in the 2015 CONCACAF Gold Cup. Editor’s Note: Which was your favourite Trinidad and Tobago senior team football game? Did you remember any we missed? Let us know. T&T holds Mexico in eight-goal thriller; Panama here we come! Previous T&T holds Mexico in eight-goal thriller; Panama here we come! Kelvin, you must remember the Bahrain game as we all do. What with the pelting of seats and other things, us having to stay in the middle of the ground until the crowd left and then the emotional dressing room. Memories we will never forget. The game itself and your last second save was memorable. 1. Bahrain 2 Sweden 3 Kerry bullet v Guatemala 4 Barber v USA. The only thing I eh do was cry.To this day could not understand how Elliot Allen start instead of him ov 19. Also.. Apart from a couple thrashing a from Mexico we do tend to so fairly well against them. I think our athleticism can hinder their game at times. Mexico are good though.. Possession wise. Away from the azteca they are beatable. Without question Trinidad greatest game is the one nil victory away to Bahrain. It was a high pressure game and we had an expectant public. A close second is the victory over Mexico to secure our playoff participation. Stern John was sensational that day. An exhibition of forward play and technique by him. The 4-4 was good the other day for excitement. But it was littered with far too many technical and tactical errors by both sides. It was good for the fans to watch. From a coaches perspective it will be viewed as an unprofessional performance littered with far too many errors . Leonson Lewis flicks the ball and crashes a spectacular volley home on the turn against Crystal Palace. Marvin Faustin flicks the ball over a player’s head and then scores a bicycle kick in a Caribbean Cup. And Terry St Louis ends a great passing moves with a couple fans and a rocket against St Vincent and the Grenadines in a Caribbean Cup final! Nigel Myers and Sim Simmer, I felt the atmosphere was so weird in that first leg game against Bahrain and the final Mexico match. Maybe it was the nerves. Great games though. I still feel few games were as emotional as that 1-0 win away to Honduras that the team dedicated to Mickey Trotman. We were already eliminated but that game was special too. Marvin, I can still visualize that rocket from Kerry. Yeah… Swedish fans were predicting 3-0 easy before kick off. Poor things. I would say our 1973 team was one of the best ever but for matches personally seen my hat goes to the 0-0 draw to Sweden at the World Cup. I still remember standing it that stadium in Dortmund beaming with pride and watching the crestfallen faces of the Swedes around us. Fus ah parade on them with our National flag waving high in the air. Not sure when i came down from that high. Also we need to rank our teams performances by the opposition and Wednesday night’s match up against Mexico was a thriller and must rank way up there. Yep. The 4-0 against Mexico was up there Bruce. For me, the match (3rd September) vs Guatemala in 1989 at the National Stadium (at the time) was the best. Kerry Jamerson’s superb 25m bullet with about 5 minutes to go to win 2-1 in the W/Cup qualifier which lead to the final game vs USA. What about the 4-0 win over Mexico in Haiti 1974, World Cup qualifier when Haiti rob us out of the World Cup? For me two games stand out the away win vs Bahrain because of the significance it had for our football and impact it had on the country ALSO the goal-less draw with Sweden when Cornell hit the bar and Shaka saved like a boss…no goals…BUT it showed that T&T DESERVED to be on the big stage and we capable of holding our own against the best in the world! All while playing with 10 men for most of the 2nd half mind you! Forgiven and hope some day to forget England use of an illegal hair pull to win a 2006 World Cup game against the T&T. And what about the match where Chris ‘Me Mum’ Birchall’s long volley kept our WC qualifying hopes alive and made him the talk of the town? I don’t know if that was a good match per se, but it was a significant win. Trinidad and Tobago vs Guatemala (July 9, 2015). T&T were leading 3-0 until Guatemala pulled one back. T&T won 3-1. Some serious aficionados here, boy. Jack pay for that, say yah…. Trinidad and Tobago vs Mexico (October 13, 2005) – Mexico takes a 1-0 lead. We get a penalty, Stern John misses. Stern John equalizes just before half-time, then seals the victory in the second half with a stunning left-foot strike into the jep nest. Aurtis Whitley was instrumental in both goals. This was a MUST WIN GAME in order to advance to the playoffs against Bahrain. Trinidad and Tobago vs Columbia in the orange bowl was also epic. 4-3 to T&T and a free Carlos Santana concert after. How I miss that one? My bad…great call! That was on the list Richard Zen O’Brien. Our draw away to the U.S. was wonderful too. What a beaut from Hutson Charles! Nice list, but no matches from the ‘Road to Italy’? TnT v Guatemala in the Stadium was an all time great! Too young to comment on some of those. But for sure some very good memories frim the gold cup semi final birth and the Sweden draw to yesterday. Keep it up team ???????? It was special indeed ?but nothing beats beating Mexico in TnT and then qualifying for the World Cup in Bahrain ???????? That list is memories boy… I would add to the list beating USA 2-1 in the 2010 qualifiers when both Dwight and Latapy scored. Renee, are you related to Keron? Yeh Renee Cummings are u? Can’t say I know the young man. took the cake. Those guys went right down to the last minute or should I say second. If we are looking at the most memorable, I will go with the win against Bahrain. Zlatan throw everything but the kitchen sink at Shaka in that game. It was an exciting game and I am pleased that finally T&T Soca Warriors are scoring more than 1 goal a game. All I ask is that the coach, the captains and the players be honest when they assess the team’s performance. Own up to glaring mistakes and make adjustments to arrest those shortfalls. At the same time, build on the good plays and fine ways to overwhelm the competition in the upcoming games. There were positives and negatives review/analyze them completely. Straight forward constructive feedback can never be more essential at the moment. Let’s win the Cup then do comparisons. Do we want the best team ever or not? Grater moments ahead ?? Lets move forward positively ??????? For the first time in quite awhile I am seeing a capable group of attackers. The goals are coming from everywhere, not just the Stern John’s or the Yorke’s or Jones’ These guys are finishing with accuracy. There is still work to be done in defense..
Bahrain as it was the game which took us to our first World Cup. In addition the vibe that flowed through T&T was epic…………. Yeah. That bit was special too Taye. Although the first half kinda deflated our dream. And Cornell Glen picked up a bad injury too that kinda ended the dream. But Latas gave us some pride there too. the WC06 game against Paraguay when Latas was on the pitch was the most sublime half-hour of T&T football. Dem fellas on that team will get a lot of calls from international teams. Marshall doesn’t saying the truth or probably doesn’t follow Wired868. The Spark believed in this team since day one.